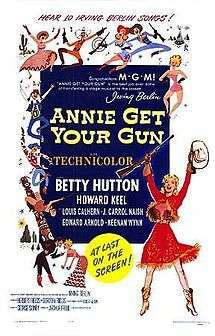 Annie Get Your Gun is a 1950 American musical Technicolor comedy film loosely based on the life of sharpshooter Annie Oakley. The Metro-Goldwyn-Mayer release, with music and lyrics by Irving Berlin and a screenplay by Sidney Sheldon based on the 1946 stage musical of the same name, was directed by George Sidney. Despite some production and casting problems (Judy Garland was fired from the lead role after a month of filming in which she clashed with the director and repeatedly showed up late or not at all), the film won the Academy Award for best score and received three other nominations. Star Betty Hutton was recognized with a Golden Globe nomination for Best Actress. The film adaptation cut the following numbers from the original score: "I'm a Bad, Bad Man", "Moonshine Lullaby", and "I Got Lost in His Arms", ("An Old Fashioned Wedding" was written for the 1966 revival). The 2000 compact disc release of the soundtrack includes all of the film's numbers and, "Let's Go West Again" (a Hutton number deleted before the film's release), an alternate take of Wynn's "Colonel Buffalo Bill", and Garland's renditions of Annie's pieces. The film was originally budgeted at $1.5 million, with $600,000 paying for the score and the book. Paramount's blonde bombshell, Betty Hutton, played Annie, with Howard Keel (making his American film debut) as Frank Butler and Benay Venuta as Dolly Tate. Frank Morgan, cast as Buffalo Bill Cody, died suddenly of a heart attack shortly after shooting the film's opening production number, "Colonel Buffalo Bill." Morgan was replaced by Louis Calhern. Judy Garland, MGM's biggest musical comedy star, was originally cast in the title role. She recorded all her songs for the soundtrack and worked for two months under the direction of Busby Berkeley and dance director Robert Alton. Berkeley and Garland had worked together previously in the late 1930s and early 1940's in a successful series of backstage musicals teaming her with fellow juvenile star Mickey Rooney. Berkeley had been fired from the Garland/Rooney musical Girl Crazy in 1943 due to personality clashes with musical director Roger Edens and for driving Garland to physical collapse during the filming of one musical number. On Annie Get Your Gun, producer Arthur Freed felt Berkeley was the right man to capture the spectacle needed. But once again, Berkeley was severe with Garland, insisting she perform at her best effort. Unfortunately, Garland was suffering from overwork and exhaustion, the dissolution of her marriage to director Vincente Minnelli, and an addiction to prescription medication. She was in no condition to undertake such a demanding role in a blockbuster production, and- based on her past experience working on these types of films with him- she resented the hard driving Berkeley. Berkeley felt Garland's attitude on the "Annie" set lacked any effort or enthusiasm. She felt Berkeley had no understanding of how to translate the material to the big screen, and was put off by his bombastic directorial style, often leaving the set when he began shouting at the actors and crew. She complained about Berkeley to studio head Louis B. Mayer, attempting to have him removed from the film. After viewing Berkeley's footage to that point, producer Freed was disappointed and fired the veteran director, replacing him with Charles Walters. Despite this change, an underweight and exhausted Garland frequently arrived late or not at all for each day's filming schedule. Finally, MGM suspended Garland's contract and removed her from the film. Garland claimed she was forced to leave the production against her will, and traveled to Boston where she was hospitalized for several weeks to regain her health. Betty Garrett was considered as a replacement, but her contract with the studio had expired and her agent asked for too much money. Ginger Rogers lobbied for the role, but the producers felt she was too mature and too glamorous for the part. After pleading for the role with both MGM and her home studio of Paramount, a loan-out deal was brokered and the part of Annie eventually went to Hutton. Shooting resumed after five months, with George Sidney replacing Charles Walters as director. According to Betty Hutton, she was treated coldly by most of the cast and crew because she replaced Garland. During an interview with Robert Osborne (first telecast on Turner Classic Movies "Private Screenings" on July 18, 2000), she recalled the other cast members being hostile and the MGM management as so unappreciative they neglected to invite her to the New York premiere. By all accounts, Hutton clashed with co-star Howard Keel. Years later, Keel recalled Hutton as "a scene stealer" and "insecure". Hutton wrote in her memoirs that Keel was a "green horn" who tried to pull focus from her performance. Reportedly, she felt the only major cast member who treated her with any kindness and respect was Louis Calhern. Betty also stated that one day Judy Garland was visiting the set and Betty greeted her with a bouncy "Hiya', Judy! ", only to be answered by a string of profanities. Only two production numbers were completed with Garland: "Doin' What Comes Naturally" and "I'm an Indian Too" and these were released to the public for the first time in the 1990s in That's Entertainment III. Additional studio recordings of Garland also exist and have been released by Rhino Records. Despite the production problems, the film became popular in its own right. During its initial release, MGM recorded it as earning $4,708,000 in the US and Canada and $3,048,000 overseas, resulting in a profit of $1,061,000. In 1973 it was withdrawn from distribution, owing to a dispute between Irving Berlin and MGM over music rights, which prevented the public from viewing this film for almost 30 years. It was not until the film's 50th Anniversary in 2000 that it was finally seen again in its entirety. One of Hutton's costumes, the very first "Wild West Show" costume seen in the film for the reprise of "There's No Business Like Show Business" is on permanent display at the Costume World Broadway Collection Museum in Pompano Beach, Florida. ↑ "NY Times: Annie Get Your Gun". NY Times. Retrieved 2008-12-20. Wikimedia Commons has media related to Annie Get Your Gun (film).